In the 1841 census Caroline Gould appears as a 15-year-old servant in the household of Robert and Ester Tucker at Hindford (Hendford), Yeovil, Somerset. Robert (Ind?) is given as 70 and his wife as 55 with no occupation specified. (Note that adult ages were rounded up to the nearest 5 years in that census - also note that Ancestry.com have transcribed their names as Robert and Ester Justin, but this does not tally with any other records). The other servants were Mary Abbott (30) and Mary Goulding (40). All are listed as being born in Somerset except Robert Tucker and Caroline. By the 1851 census, Caroline had moved to St Hilary, near Cowbridge, Glamorgan where she appears to have spent the rest of her life. She was recorded as a female servant, aged 25, born Yeovil, Somersetshire working at Beaupre House for the widowed Frances Bassett. There were four other servants. In the 1861 census she was living in the village with her husband, John Williams (34) and sons George (5) and John (4) - all born in St Hilary. Intriguingly, Caroline has now gained three years and is recorded as being 38. She also gives a birthplace of Compton in Dorsetshire. John Williams was a mason and one of the numerous Williams in the village. According to the National Burials Index a John Williams aged 43 was buried at the Church of St Hilary on March 7 1870. By the 1871 census, Caroline was widowed but still living in the village at age 47, a seamstress. Her sons were still with her: George (15) an apprentice draper, John (14) a laborer (sic), and William (8). In 1881, the census shows her as 60, again born Yeovil, Somerset and a seamstress living in the village of St Hilary. Two sons remain with her: John (24) a gardener and William (18) a carpenter (apprentice). Also in the house is David Walters (37), a lodger and widowed labourer, born Babcary, Somerset. (See David Walter - Babcary and Swansea). In the 1891 census she is still in the village, living on her own as a seamstress aged 70 and giving Yeovil as her place of birth. A Caroline Williams died in the Bridgend and Cowbridge registration district in March Quarter 1899 aged 79. 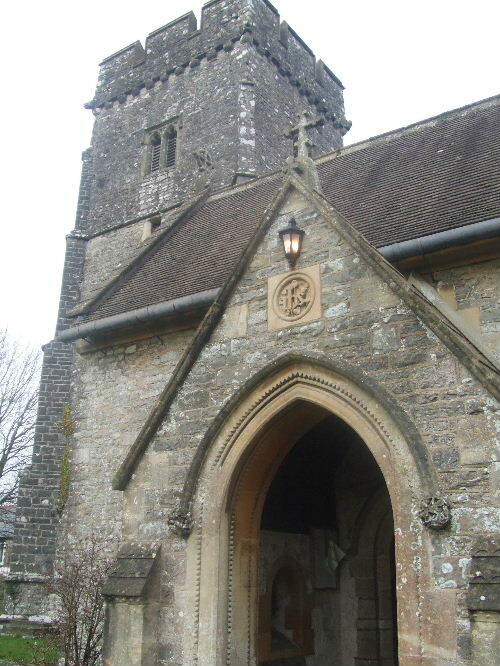 According to the National Burials Index she was buried at the Church of St Hilary on March 15 of that year.